Compare prices from several car hire companies in Tarragona and find the best price for car rental. Our prices always include unlimited mileage and insurance. 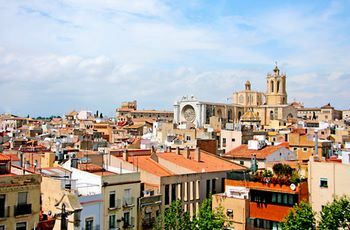 Tarragona is the capital of the province of Tarragona region that belongs to Spain. The city is located northeast of Spain bordering the Mediterranean Sea, while Barcelona is located about 100 km further north. Tarragona already existed when the Romans took over the board, and today is home to around 140 000 inhabitants here (2010). After the Romans, one can include the remains of a city wall, an amphitheater and a 35 meter-long aqueduct that the Romans used to bring water into town. Passeig Arqueologicas is a road that follows the old city wall around the old town. In addition, the Tarragona on old churches and monasteries, beaches and museums. Reus Airport is only 10 km from Tarragona, and from here you can fly to cities like Brussels, Dublin and Palma de Majorca.